1 Hello, and welcome. My name is ________, and I’m a volunteer with the American Heart Association. Casi el 40 por ciento de las muertes en los EEUU se debe a las enfermedades cardiovasculares Los ataques al corazón y paros cardíacos son peligrosos y pueden ser letales David’s not alone by any means. 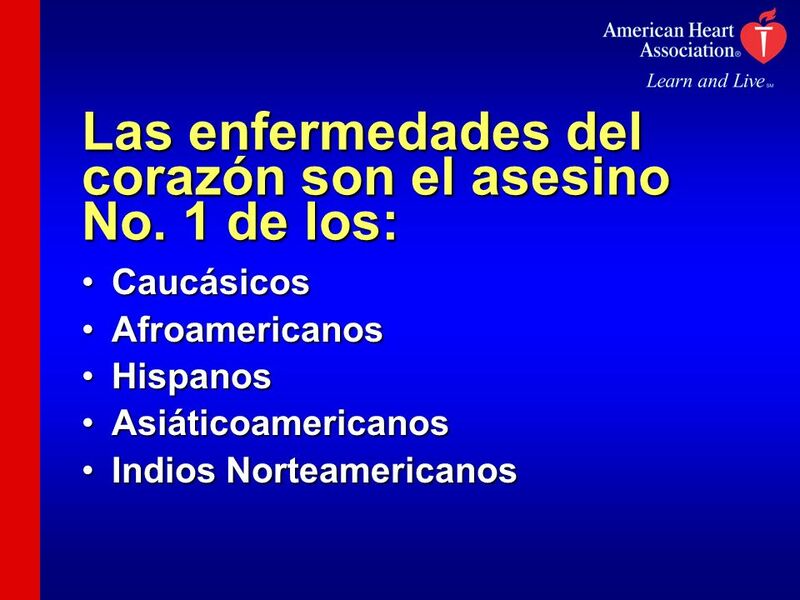 Here are some statistics that show how widespread and serious heart and blood vessel diseases are. 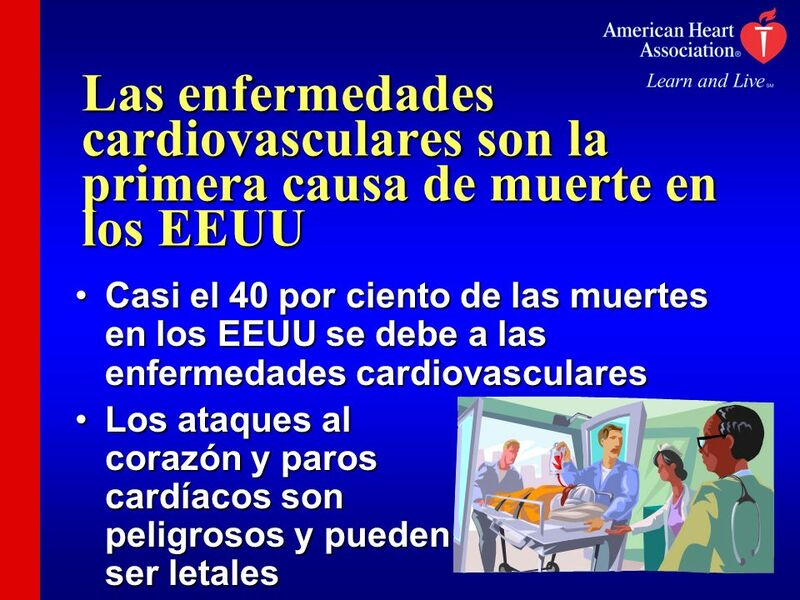 Cardiovascular diseases are heart and blood vessel diseases. They include heart attack, cardiac arrest and stroke. Other cardiovascular diseases include high blood pressure, heart failure and congenital heart defects. We’ll focus on heart attack and cardiac arrest today. To understand events like heart attack and cardiac arrest, you first need to know how the heart works. Let’s talk about that now. 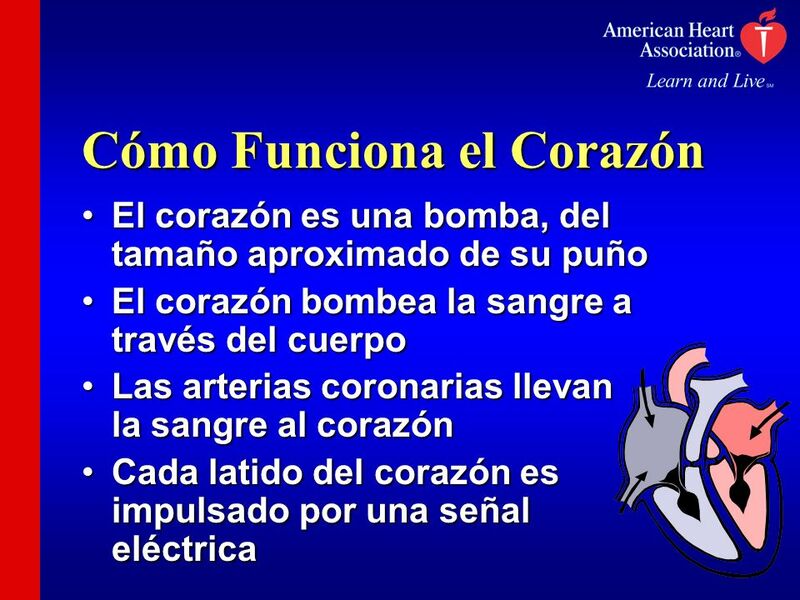 El corazón es una bomba, del tamaño aproximado de su puño El corazón bombea la sangre a través del cuerpo Las arterias coronarias llevan la sangre al corazón Cada latido del corazón es impulsado por una señal eléctrica The heart pumps blood to all parts of the body. It brings oxygen and nutrients to the body’s cells. The heart muscle gets the oxygenated blood it needs from the coronary arteries, which wrap around the outside of the heart. The heart pumps because its natural pacemaker, called the sinus node, sends an electrical signal that goes from the top of the heart to the bottom. The pacemaker works like a battery, and the electrical impulses flow down paths that act like wires. 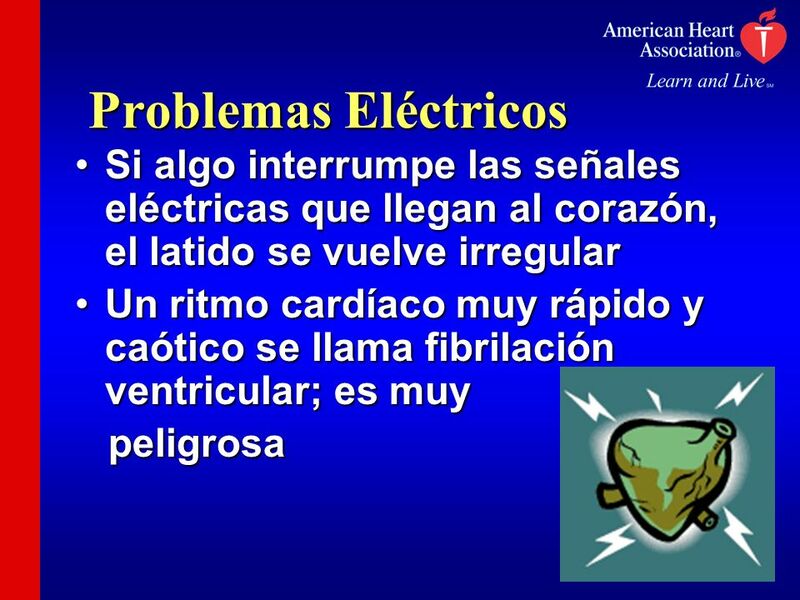 Electrical impulses make the heart contract, which pumps out the blood. You need a pumping heart to stay alive. Without oxygen, cells start to die. A person can only live a few minutes without oxygen before irreversible brain injury and death occur. 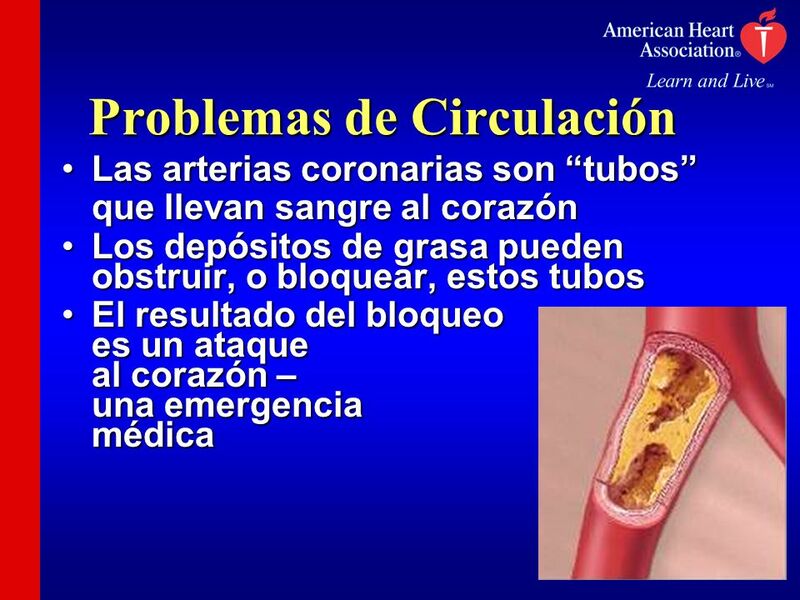 Las arterias coronarias son “tubos” que llevan sangre al corazón Los depósitos de grasa pueden obstruir, o bloquear, estos tubos El resultado del bloqueo es un ataque al corazón – una emergencia médica Heart and blood vessel problems develop over time. Plaque is a deposit of cells, fat and cholesterol that can build up in artery walls. These fatty buildups can mean that less blood flows to the heart. This can cause chest pain called angina pectoris. If the plaque splits open, a clot can form and narrow or close part of the artery. Then part of the heart doesn’t get the blood it needs and starts to die. This is a heart attack -- and it’s an emergency. 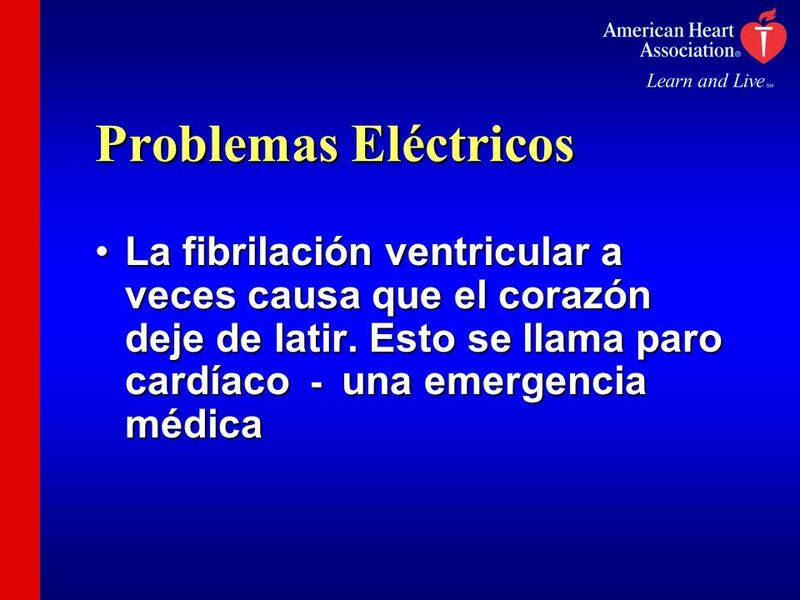 6 Problemas Eléctricos Si algo interrumpe las señales eléctricas que llegan al corazón, el latido se vuelve irregular Un ritmo cardíaco muy rápido y caótico se llama fibrilación ventricular; es muy peligrosa A heart attack can cause the electrical signals from the pacemaker to go haywire, or the electrical system can go crazy on its own. When this happens, the signals often come too fast, and the heart’s lower chambers start quivering instead of beating and can’t pump blood. This is called ventricular fibrillation. You may know it as cardiac arrest, and it’s an emergency. Let me talk first about heart attack, then I’ll talk about cardiac arrest. 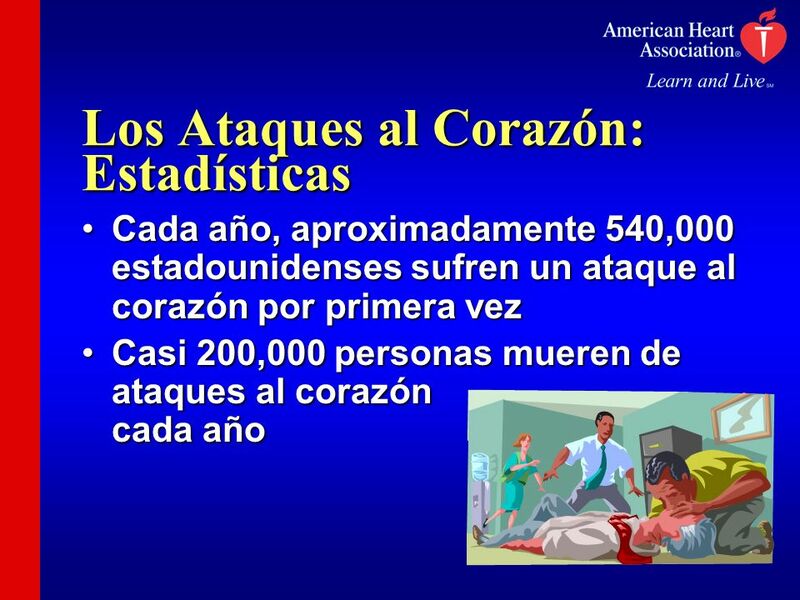 Cada año, aproximadamente 540,000 estadounidenses sufren un ataque al corazón por primera vez Casi 200,000 personas mueren de ataques al corazón cada año Heart attacks are common — and deadly. That’s why it’s so important to know the warning signs. Malestar en el medio del pecho que dura más de unos minutos, o que se va y luego vuelve. Se puede sentir presión incómoda, constricción o dolor. 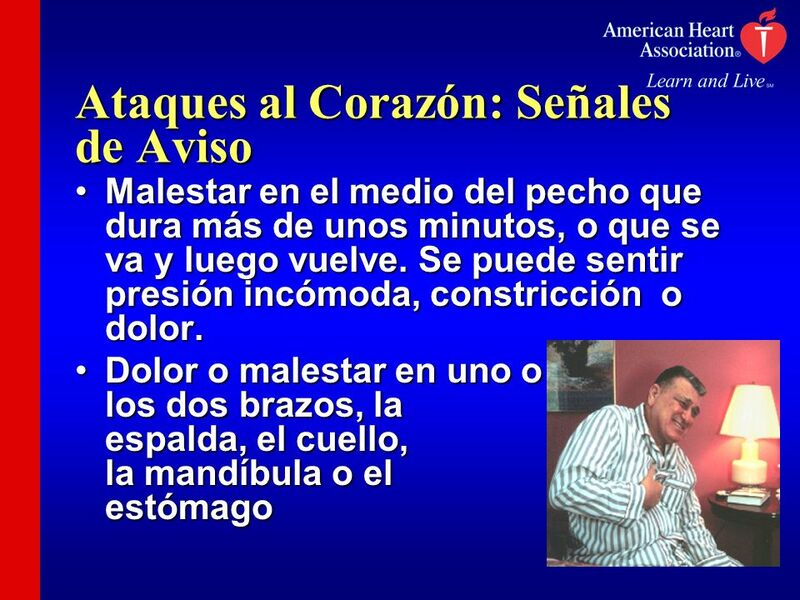 Dolor o malestar en uno o los dos brazos, la espalda, el cuello, la mandíbula o el estómago These are two warning signs of heart attack. Dificultad para respirar. Puede ocurrir con o sin malestar en el pecho Otras señales. 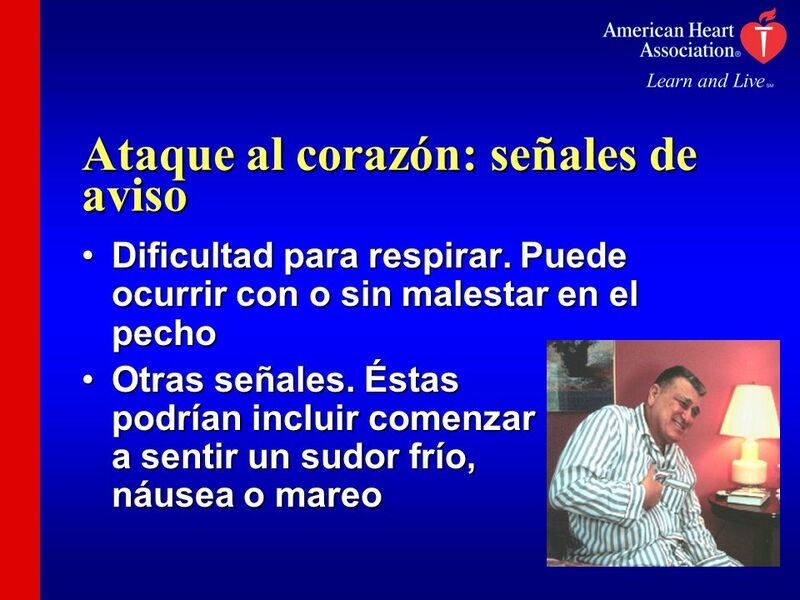 Éstas podrían incluir comenzar a sentir un sudor frío, náusea o mareo These are also heart attack warning signs. If you or someone you’re with ever has heart attack warning signs, respond immediately. Don’t wait — call Sometimes the signs go away and come back, or only some signs are present. If you have any of these signs and they last for more than a few minutes, get help fast. Call immediately. Don’t call family, friends, neighbors or even a doctor. Call 9-1-1! A heart attack is an emergency, and it’s important to respond as quickly as possible. In fact, it’s a matter of life and death! If you don’t believe me, just ask someone who’s had one. 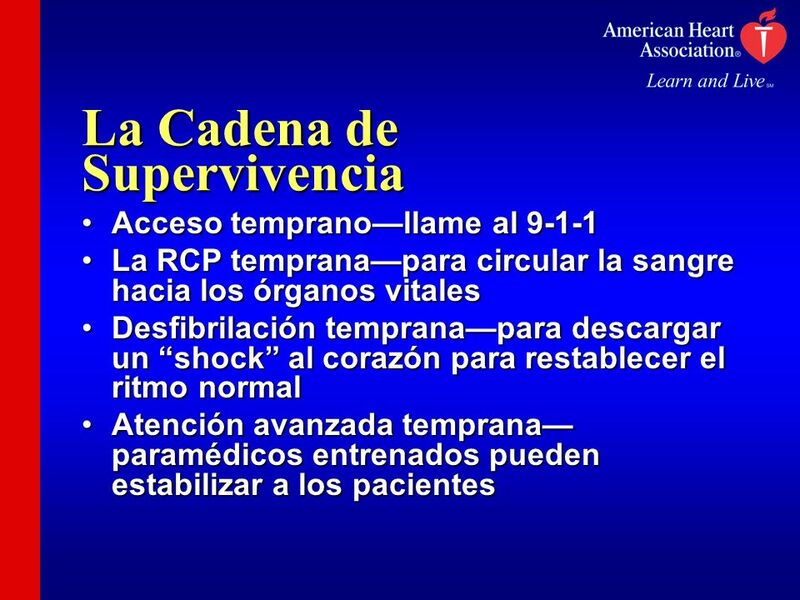 No reconocen los síntomas Perciben los síntomas, pero los atribuyen a otras causas Niegan tener los síntomas No quieren hacer una escena, o no quieren estar equivocadas No saben que pueden llamar al 9-1-1 Many people expect a heart attack to be sudden and intense, a crushing chest pain that knocks them to the floor. But often heart attacks begin with vague symptoms that slowly intensify. The pain or discomfort can be relatively mild, and the symptoms may come and go. Because of this, many people aren’t sure if they’re having a heart attack or resist believing it, so they wait. They may think their symptoms are due to another disease or condition. Others are afraid of causing a scene or are afraid of how embarrassed they’d be if it was a false alarm. Still others don’t realize the urgent need to get to a hospital fast. A final mistake that people make is not knowing to call … or trying to go to the hospital themselves rather than calling Don’t you make these mistakes. 12 ¡Una demora podría resultarle fatal! 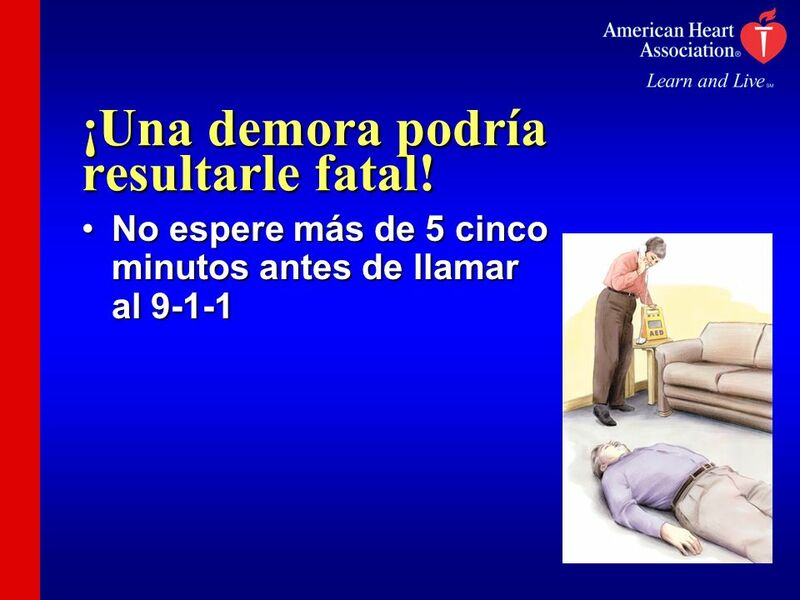 No espere más de 5 cinco minutos antes de llamar al 9-1-1 I can’t emphasize strongly enough the importance of calling There are good reasons for that. 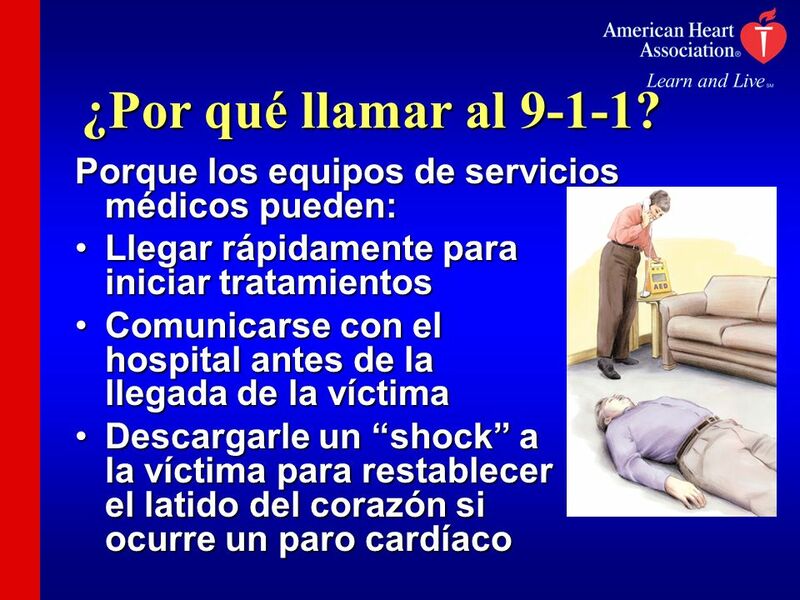 13 ¿Por qué llamar al 9-1-1? Porque los equipos de servicios médicos pueden: Llegar rápidamente para iniciar tratamientos Comunicarse con el hospital antes de la llegada de la víctima Descargarle un “shock” a la víctima para restablecer el latido del corazón si ocurre un paro cardíaco Unless you have no other option, you should always call in a cardiac emergency. And don’t delay. Calling is the best way to get the help you need quickly. 14 ¡El tiempo es crítico! 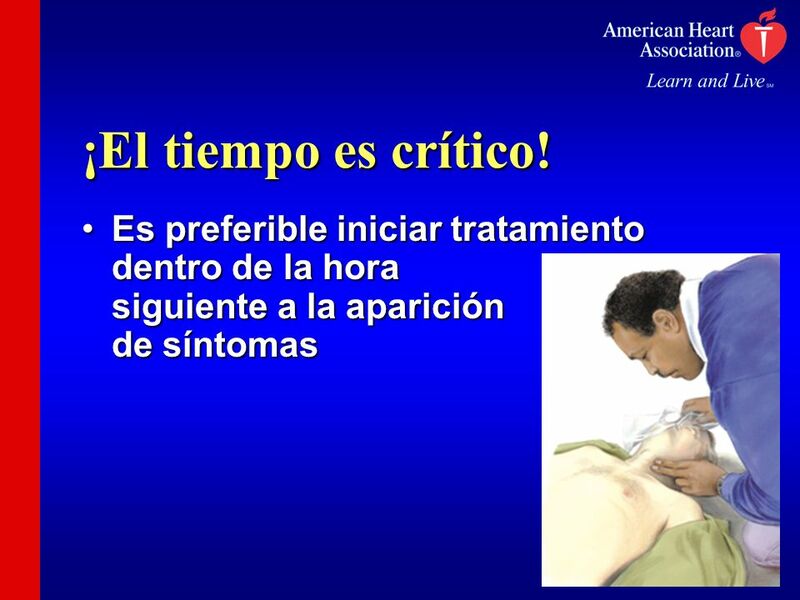 Es preferible iniciar tratamiento dentro de la hora siguiente a la aparición de síntomas With each passing minute, more heart muscle dies. And dead heart muscle can’t be restored. That’s why getting quick treatment is so important. Estas medidas restablecen el flujo sanguíneo y preservan el tejido del corazón: Los anticoagulantes disuelven los coágulos La angioplastia abre la arteria La cirugía de “bypass” reencamina el flujo de sangre alrededor del bloqueo Today, thanks to research, we have many options we didn’t have before. These options can prevent more damage from occurring, but they can’t undo damage that’s already been done. That’s why quick action is so important. 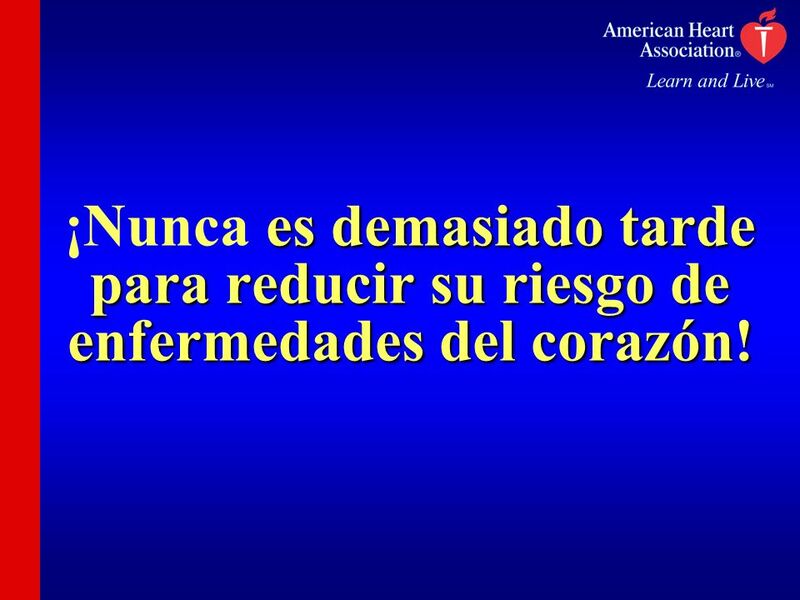 It minimizes damage to the heart. Now let’s talk about cardiac arrest. I’ll start with some statistics. Se estima que 340,000 estadounidenses sufren un paro cardíaco fuera del hospital cada año Sólo un 5 por ciento de las víctimas sobrevive What do you think about this? Pretty frightening, huh? These are staggering statistics, but they don’t have to be so grim. Many of these people could be saved if they got the right kind of help quickly. 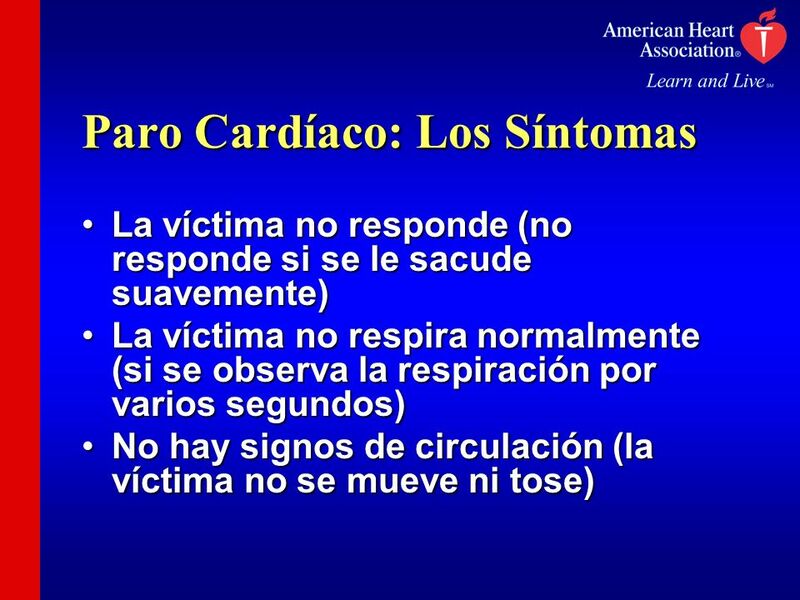 La víctima no responde (no responde si se le sacude suavemente) La víctima no respira normalmente (si se observa la respiración por varios segundos) No hay signos de circulación (la víctima no se mueve ni tose) Cardiac arrest strikes immediately and without warning. 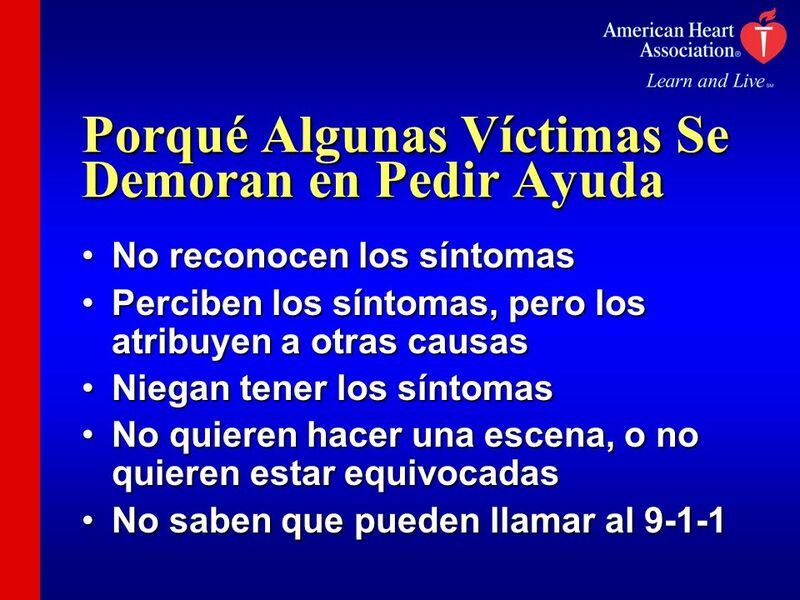 The first sign is often that the victim collapses and is unconscious. 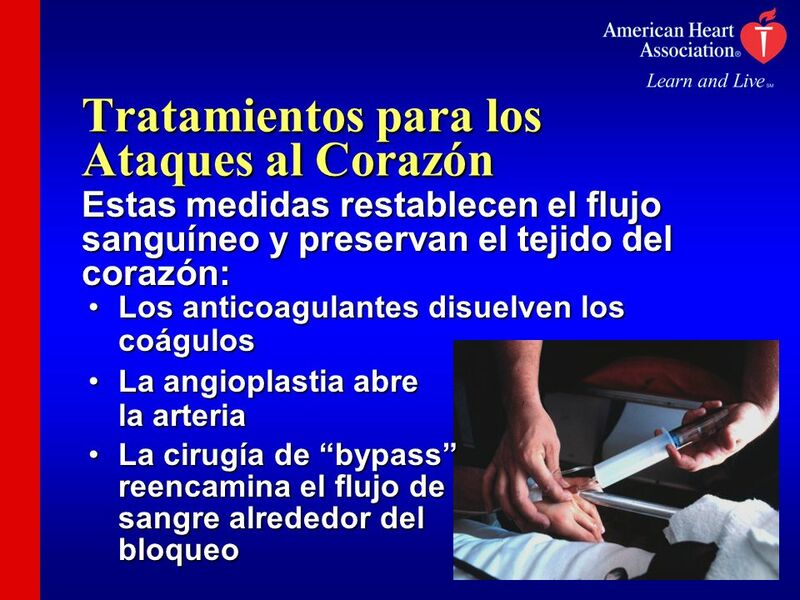 Acceso temprano—llame al 9-1-1 La RCP temprana—para circular la sangre hacia los órganos vitales Desfibrilación temprana—para descargar un “shock” al corazón para restablecer el ritmo normal Atención avanzada temprana—paramédicos entrenados pueden estabilizar a los pacientes Saving the life of a cardiac arrest victim requires a four-step process called the chain of survival. These are the steps. Early access means that people recognize a cardiovascular emergency and immediately call Early CPR means CPR is given quickly and properly when it’s needed. The mouth-to-mouth breathing and chest compressions keep blood and oxygen circulating, which buys time until defibrillation can occur. Early defibrillation means having immediate access to an automated external defibrillator. This allows trained rescuers to shock a victim’s heart so it can resume a normal rhythm. Early advanced care means having qualified paramedics with up-to-date Advanced Cardiac Life Support training. They can stabilize patients. 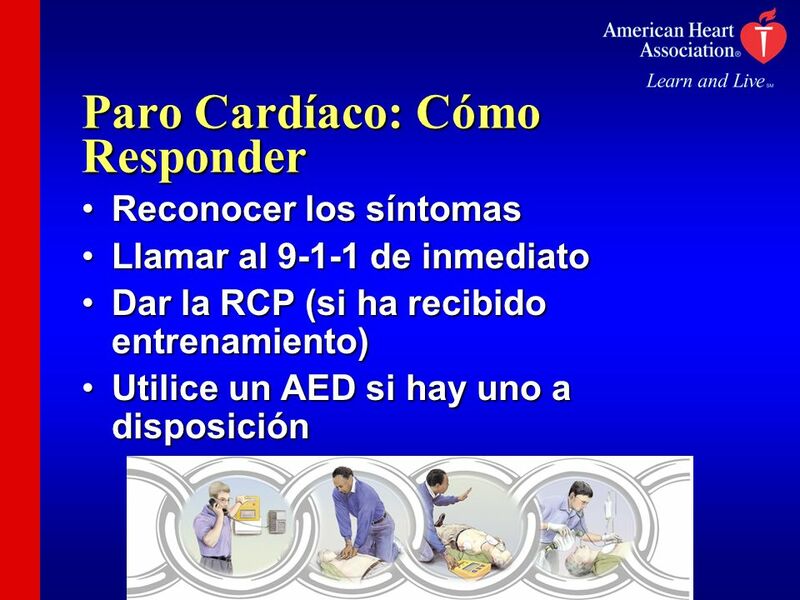 Reconocer los síntomas Llamar al de inmediato Dar la RCP (si ha recibido entrenamiento) Utilice un AED si hay uno a disposición Cardiac arrest is an extreme emergency. Every second counts! With each minute that passes, a victim’s chances of survival drop by 7 to 10 percent. That’s why it’s so important to respond promptly and properly. 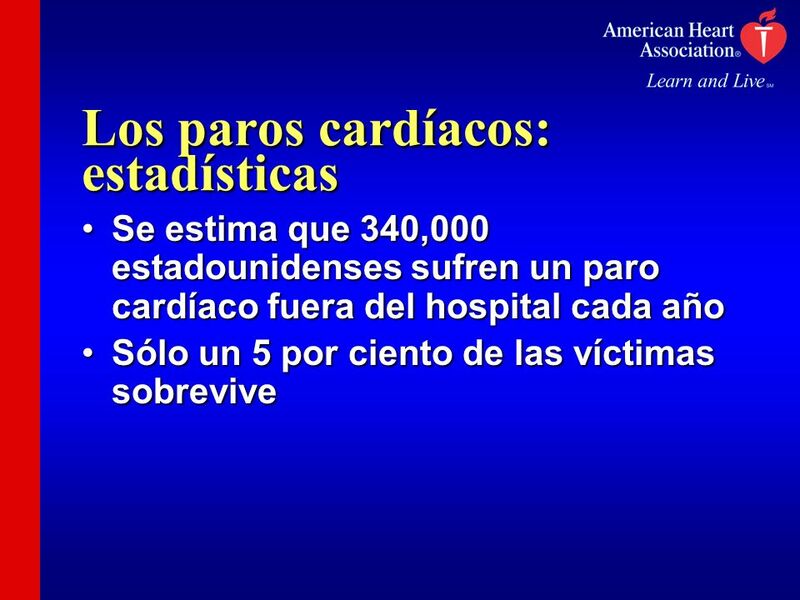 A moment ago I showed a slide that said that only 5 percent of cardiac arrest victims survived. Experts believe that with a good chain of survival in place, we could save not 5 percent, but 20 percent of victims or more. That’s thousands of lives a year. If you’ve never taken a CPR course, I urge you to do so. If you’ve taken one but it’s been more than two years ago, take one to refresh your skills. 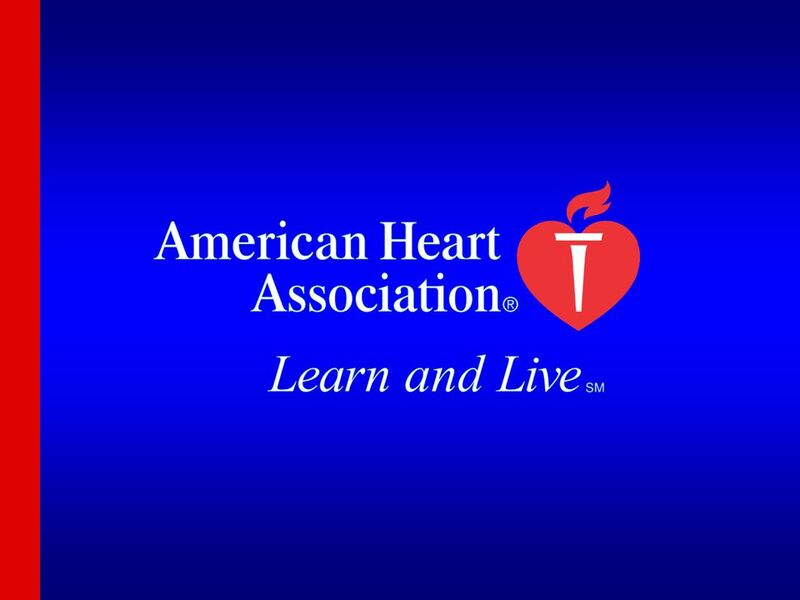 The American Heart Association offers CPR courses, including some that teach you how to use an AED. See the handout for information on our courses. Speaker: Include handout on local course offerings and the numbers to call to sign up. 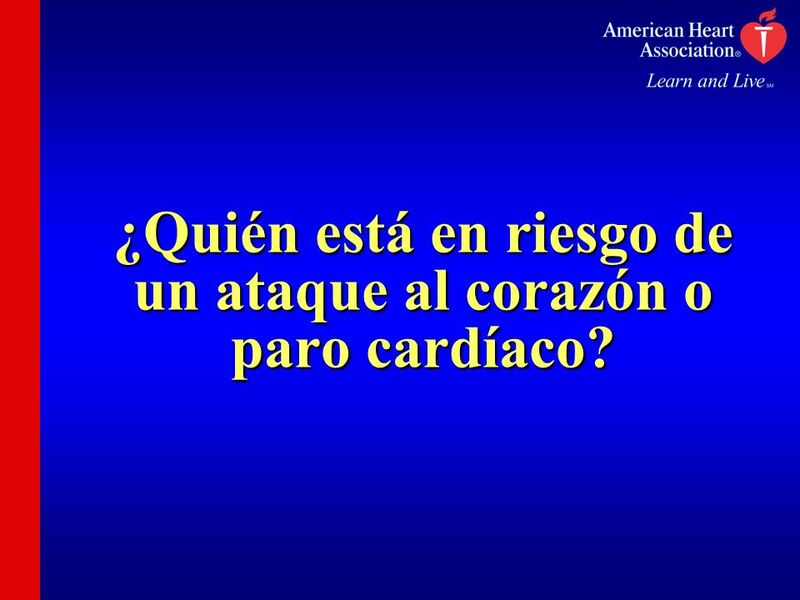 20 ¿Quién está en riesgo de un ataque al corazón o paro cardíaco? Caucásicos Afroamericanos Hispanos Asiáticoamericanos Indios Norteamericanos As you can see, people in every racial and ethnic group are victims. African Americans — both men and women — are at particularly high risk. 22 ¿Qué son los factores de riesgo? 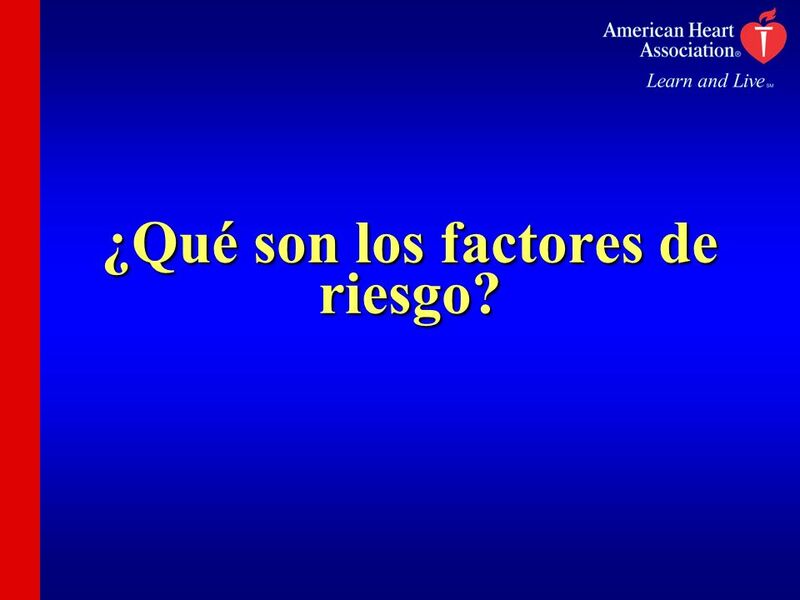 Risk factors are the factors that increase the odds that you’ll have heart disease. The more risk factors you have, the higher your risk. Some risk factors you can’t control, but others you can. 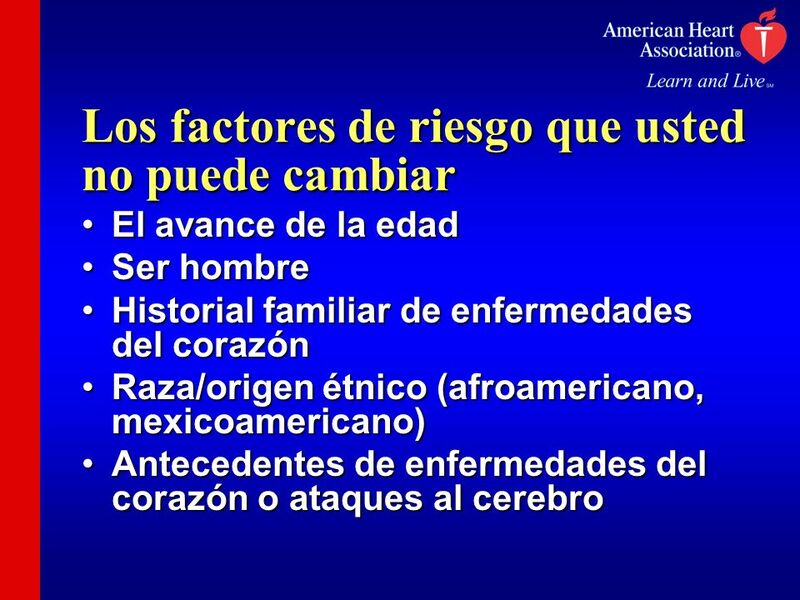 El avance de la edad Ser hombre Historial familiar de enfermedades del corazón Raza/origen étnico (afroamericano, mexicoamericano) Antecedentes de enfermedades del corazón o ataques al cerebro These are risk factors you can’t control. If you have some of these risk factors, it’s even more important to control the risk factors that you can do something about. 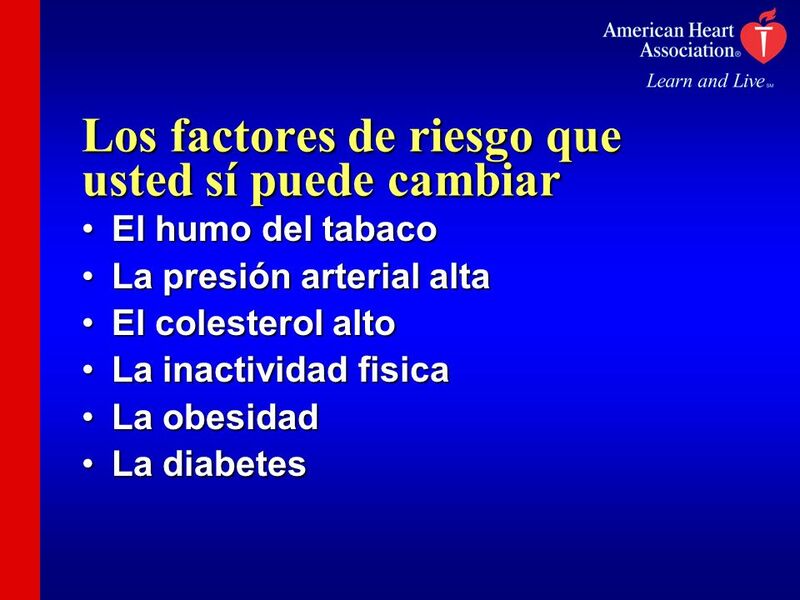 El humo del tabaco La presión arterial alta El colesterol alto La inactividad fisica La obesidad La diabetes These are the risk factors that you can control. By changing your lifestyle, you may be able to eliminate or reduce them. Other factors not shown here — but that may also contribute to risk — are drinking too much alcohol, drug abuse and stress. Let’s look at each of these listed risk factors individually. 25 ¡Conozca las cifras! 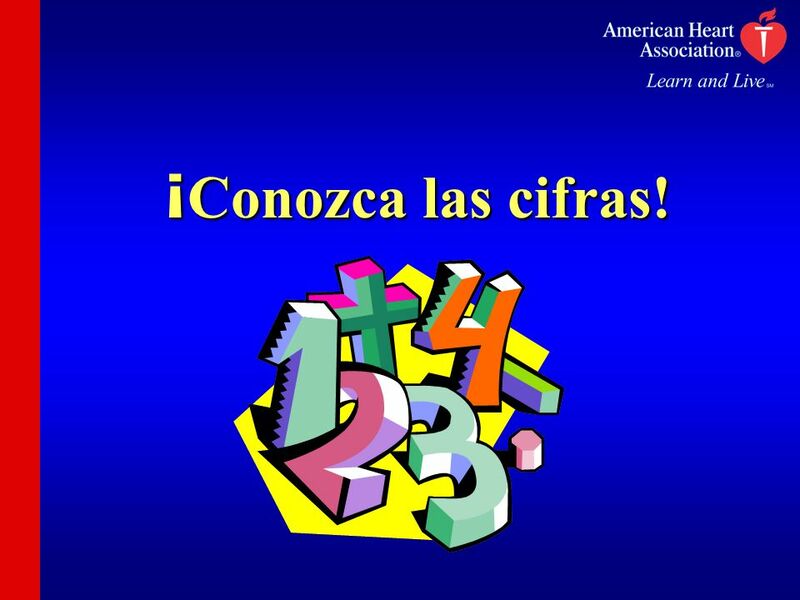 The first step in reducing your risk is to know your numbers. Here’s a quick guide. El número de cigarrillos que usted puede fumar diariamente sin perjudicar su salud: ¡0! 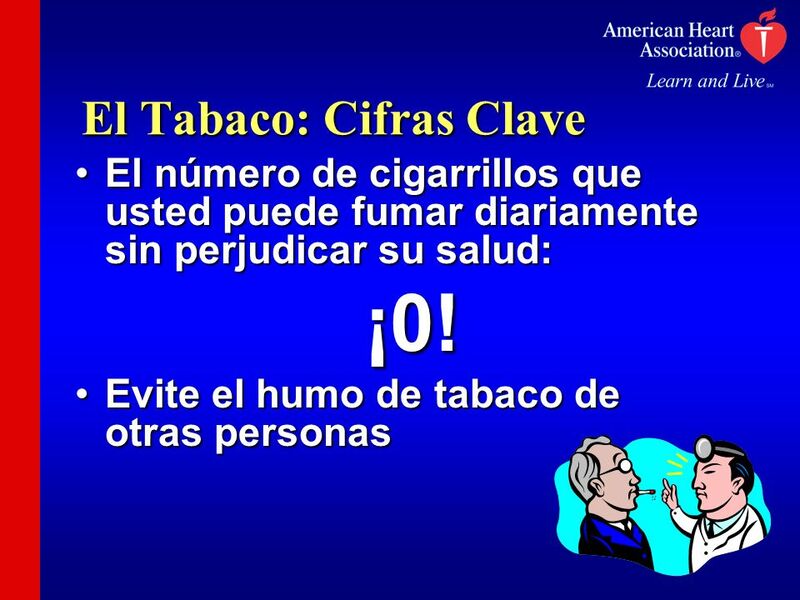 Evite el humo de tabaco de otras personas Smoking is the first risk factor I want to talk about. The U.S. Surgeon General says that cigarette smoking is the No. 1 preventable cause of death in the United States. Secondhand smoke is also deadly. In fact, each year about 35,000 nonsmokers die from coronary heart disease from breathing other people’s tobacco smoke. If you smoke, quit. I know it’s hard, but do it anyway for yourself and your family. If you quit and have a relapse, don’t give up. Many people try to quit several times before they’re successful. Every day smokers become nonsmokers. You can, too. If you don’t smoke, don’t start, and avoid breathing other people’s smoke. Speaker: Consider offering a handout or source of local smoking cessation programs. 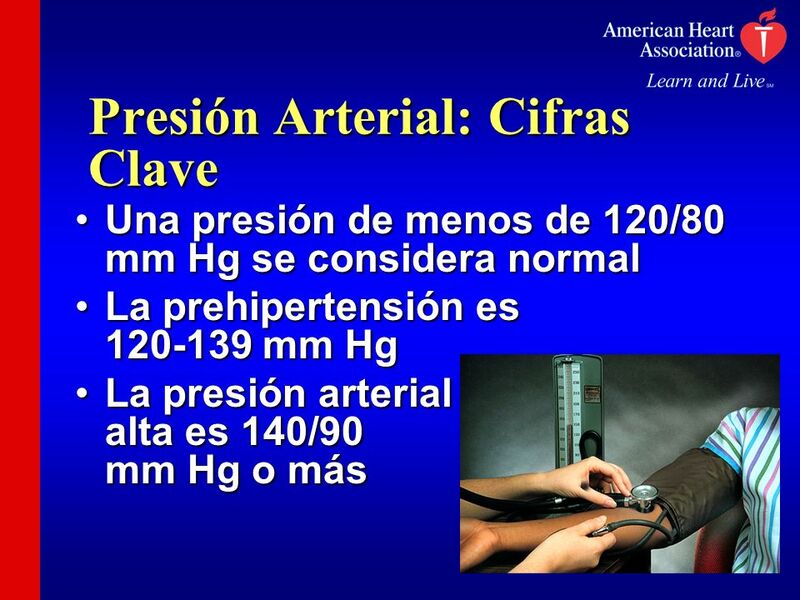 Una presión de menos de 120/80 mm Hg se considera normal La prehipertensión es mm Hg La presión arterial alta es 140/90 mm Hg o más Blood pressure is the force of the blood against your arteries. The top, higher number is the systolic pressure. It’s the force against the arteries when the heart beats. The other number is the diastolic pressure. It’s the force when the heart is at rest. Higher numbers mean the heart has to work harder to pump blood throughout the body. That makes the heart and arteries more prone to injury. High blood pressure has no symptoms, but it’s very serious. It increases the risk of heart attack, stroke, heart failure, kidney failure and eye damage. African Americans are at particularly high risk of high blood pressure. How many of you know what your blood pressure is? Let’s see your hands. (See response) It’s important to know your blood pressure. You should have it tested about once a year. 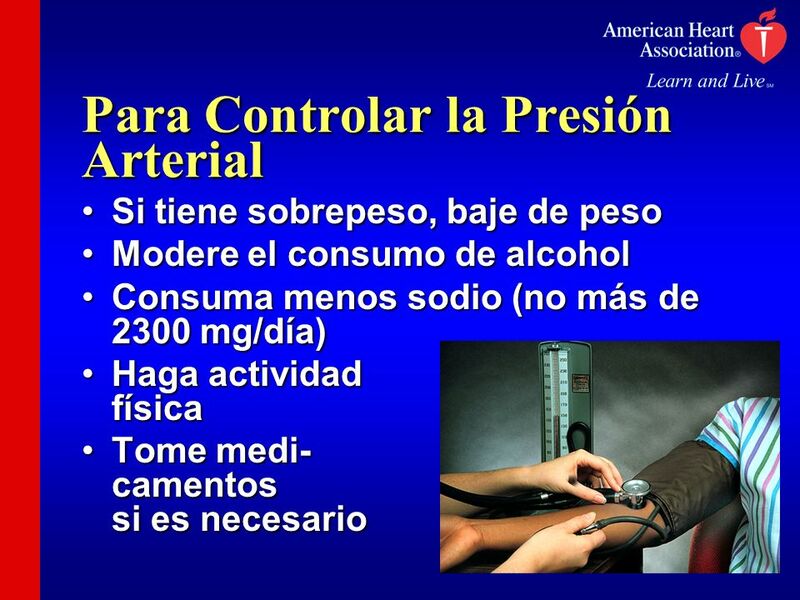 Si tiene sobrepeso, baje de peso Modere el consumo de alcohol Consuma menos sodio (no más de 2300 mg/día) Haga actividad física Tome medi- camentos si es necesario Here are some tips for controlling blood pressure. If you take blood pressure medicine and have side effects, tell your doctor. Don’t just stop taking your medicine. You and your doctor need to work together to find a medicine -- or combination of medicines -- that works for you. If you don’t take your medicine and don’t control your blood pressure, you are at higher risk of having a heart attack or stroke. 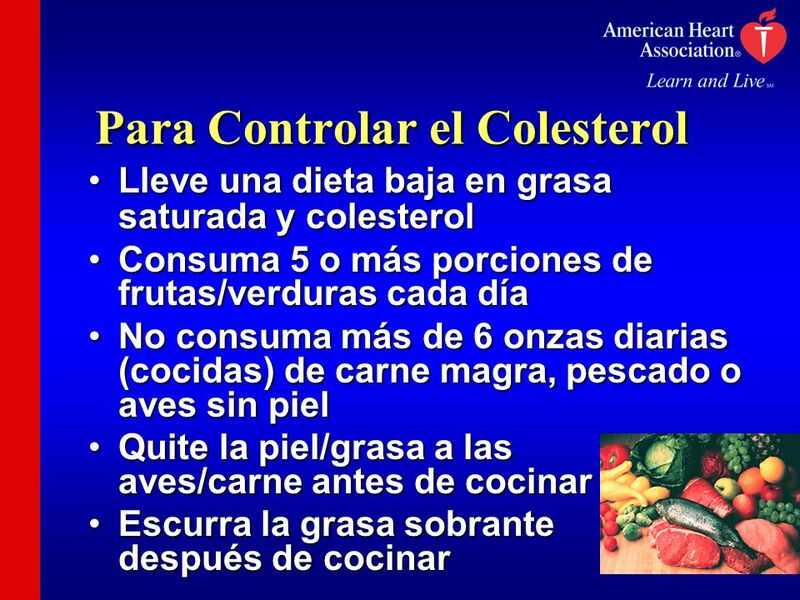 Colesterol total Colesterol HDL (el “bueno”) Colesterol LDL (el “malo”) Triglicéridos You also need to know your cholesterol levels. Cholesterol is a fatty material; your body makes some of it and you also get it from foods from animals like meats and dairy products. Cholesterol is carried in your blood. If you have too much cholesterol, it tends to build up in artery walls as plaque deposits, increasing your risk of heart attack. You should have your cholesterol tested every five years, and more often if your levels are high. There are different types of cholesterol that are measured. Let’s look at each of them now. 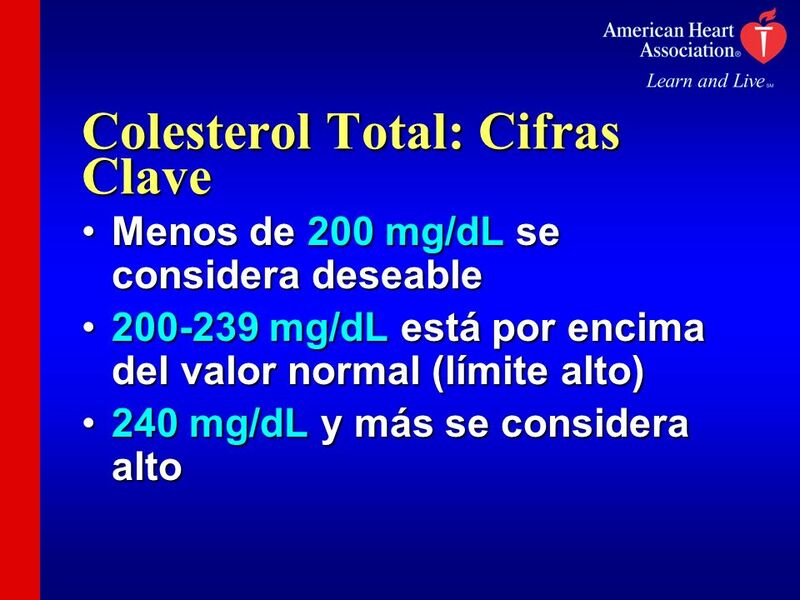 Menos de 200 mg/dL se considera deseable mg/dL está por encima del valor normal (límite alto) 240 mg/dL y más se considera alto These are the numbers for total cholesterol. 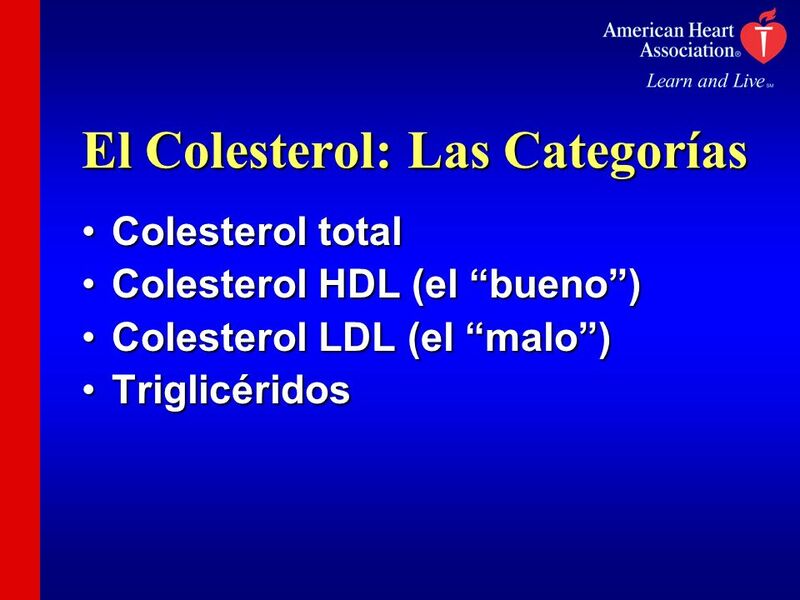 As you can see, a lower total cholesterol number is better. The risk of heart attack is about twice as high for someone with cholesterol of 240 as it is for someone whose level is below 200. 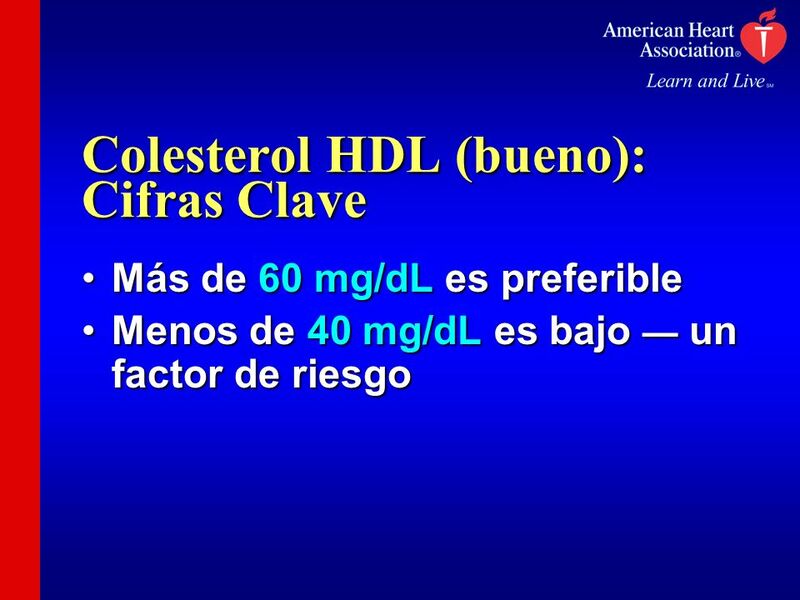 Más de 60 mg/dL es preferible Menos de 40 mg/dL es bajo — un factor de riesgo HDL is the good cholesterol — it helps keep arteries clear of fatty deposits. One way to raise your HDL cholesterol level is by being physically active. 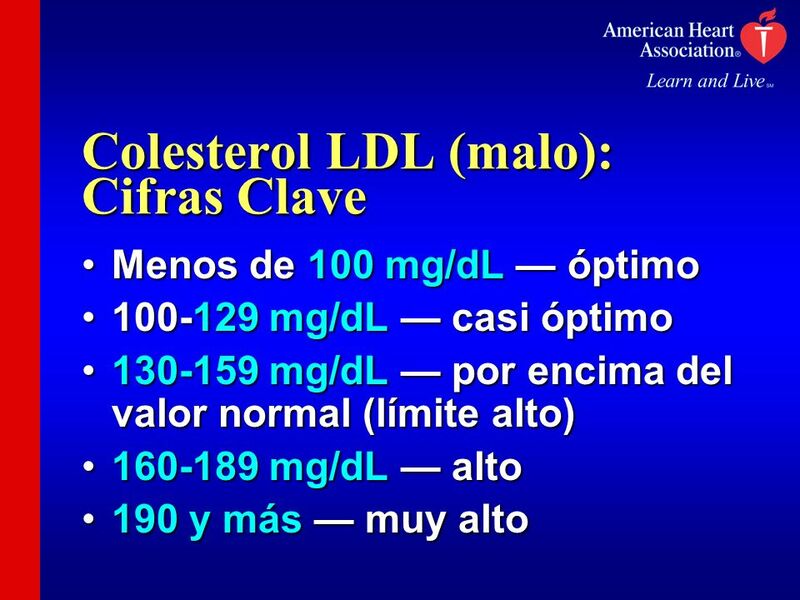 Menos de 100 mg/dL — óptimo mg/dL — casi óptimo mg/dL — por encima del valor normal (límite alto) mg/dL — alto 190 y más — muy alto LDL cholesterol is the bad cholesterol. It tends to build up in artery walls, forming plaque deposits that increase the risk of heart attack. 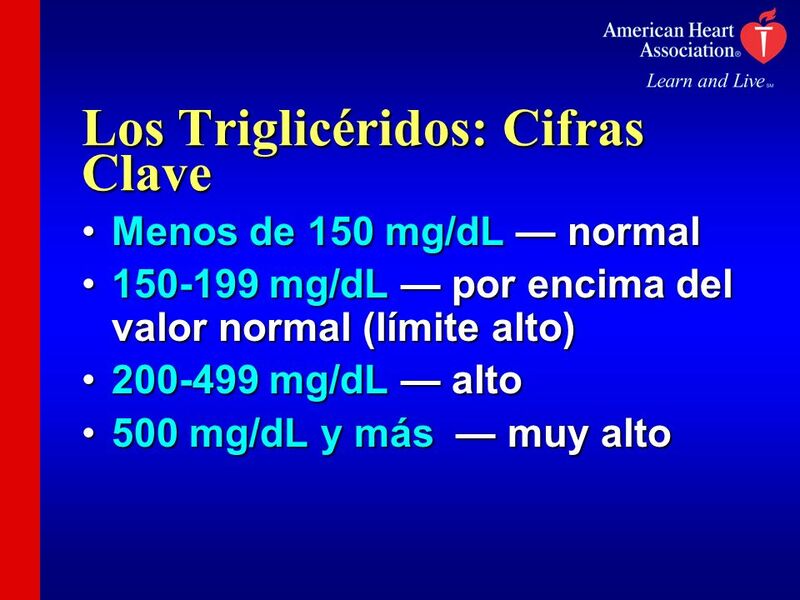 Menos de 150 mg/dL — normal mg/dL — por encima del valor normal (límite alto) mg/dL — alto 500 mg/dL y más — muy alto Triglycerides are another type of fat in the blood. High triglycerides are linked with coronary artery disease in some people. Lleve una dieta baja en grasa saturada y colesterol Consuma 5 o más porciones de frutas/verduras cada día No consuma más de 6 onzas diarias (cocidas) de carne magra, pescado o aves sin piel Quite la piel/grasa a las aves/carne antes de cocinar Escurra la grasa sobrante después de cocinar I want to give each of you a copy of the American Heart Association Eating Plan for Healthy Americans. It’s an excellent reference for healthy eating. Speaker: Make sure the booklet is available to distribute. 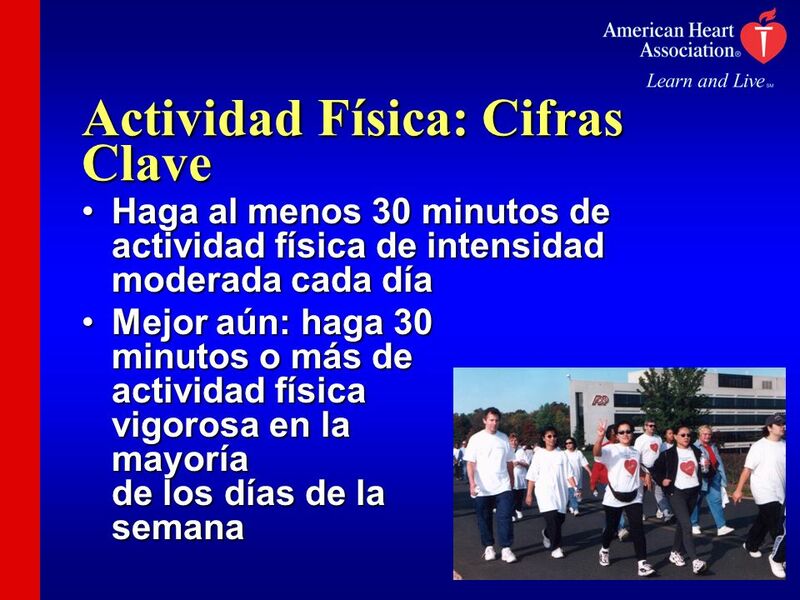 Haga al menos 30 minutos de actividad física de intensidad moderada cada día Mejor aún: haga 30 minutos o más de actividad física vigorosa en la mayoría de los días de la semana Physical inactivity is another risk factor for heart disease. Being active helps cut your risk. Moderate activities include walking, gardening, yard work, dancing, taking the stairs, playing with kids, housework and washing the car. Vigorous activities might include brisk walking, hiking, jogging, bicycling, swimming, roller skating or jumping rope. If you’re middle-aged or older and haven’t been active, talk to your doctor before beginning an exercise program. 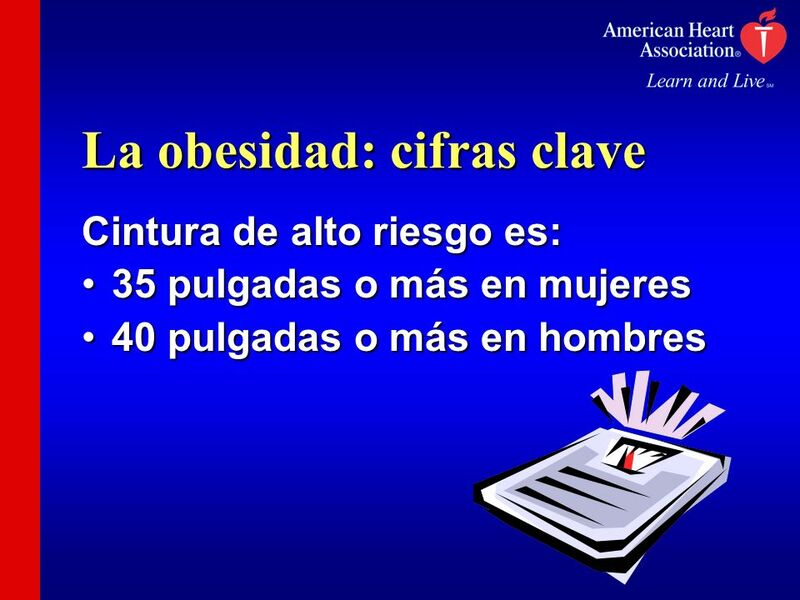 Cintura de alto riesgo es: 35 pulgadas o más en mujeres 40 pulgadas o más en hombres Eating a healthy diet and getting regular exercise will help you lose weight or stay at a healthy weight. The numbers on the screen are for your natural waist size (measured a little above your navel), not your pant size. 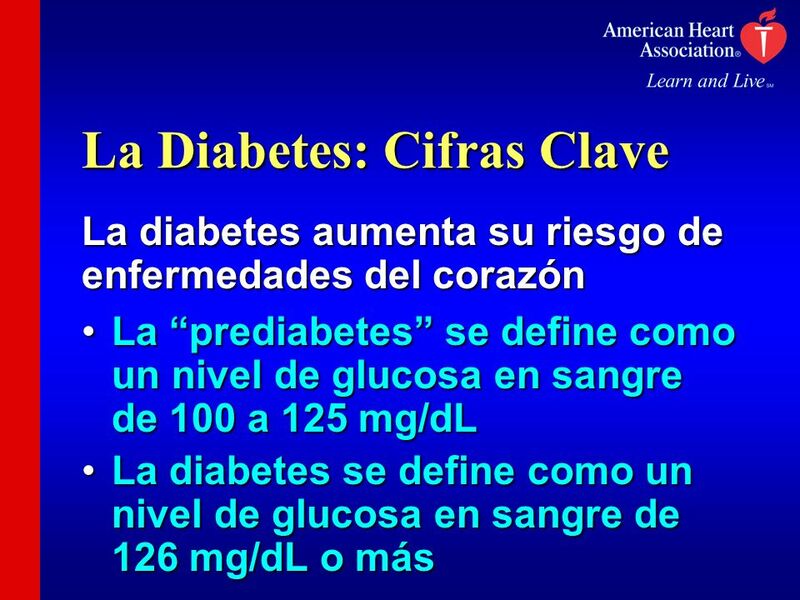 La diabetes aumenta su riesgo de enfermedades del corazón La “prediabetes” se define como un nivel de glucosa en sangre de 100 a 125 mg/dL La diabetes se define como un nivel de glucosa en sangre de 126 mg/dL o más Diabetes is the inability of the body to properly use glucose (blood sugar) or the lack of insulin. Insulin is what converts sugar and starch into the energy needed for daily life. Diabetes greatly increases your risk of developing heart and blood vessel diseases. In fact, two-thirds to three-quarters of people with diabetes die of cardiovascular disease. If you have diabetes, it’s very important to follow your doctor’s advice and control any other risk factors you have. 38 ¡Nunca es demasiado tarde para reducir su riesgo de enfermedades del corazón! 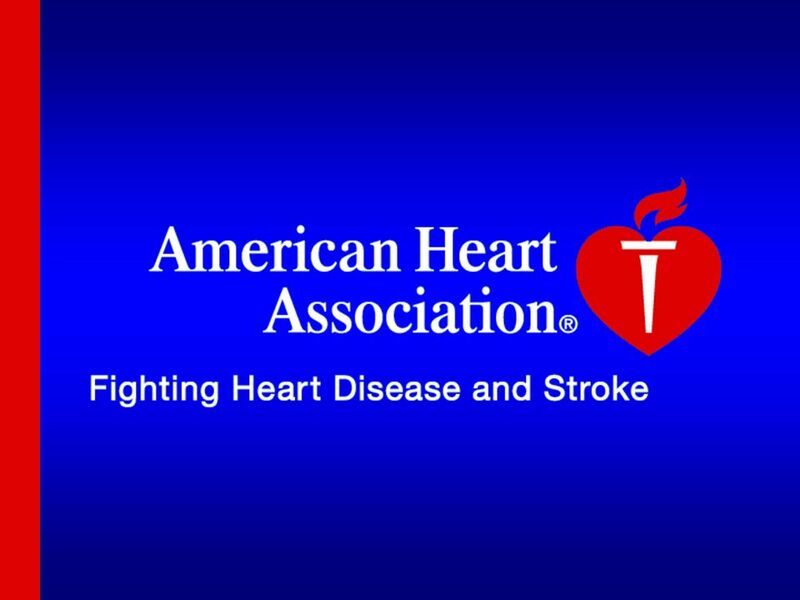 It’s never too late to start reducing your risk of heart disease. So why not start now? 39 ¿Qué son los primeros pasos de prevención? 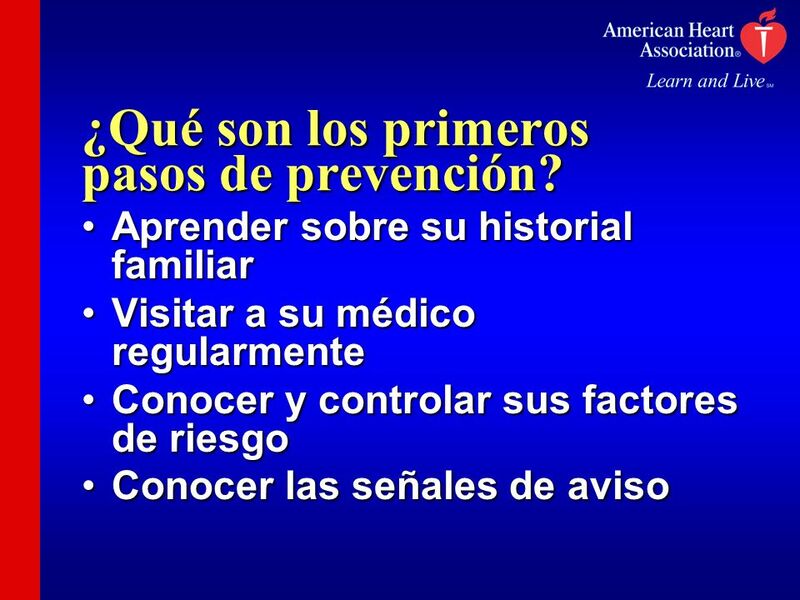 Aprender sobre su historial familiar Visitar a su médico regularmente Conocer y controlar sus factores de riesgo Conocer las señales de aviso Learn your family history. Ask family members about their health. Focus on your parents and brothers and sisters first. Next, ask your grandparents, aunts and uncles. Is there a family history of heart disease, high blood pressure, high cholesterol, diabetes or stroke? Make sure to share this information with your doctor. See your doctor regularly. Do you remember your risk factors? Tobacco smoke, high blood pressure, high cholesterol, physical inactivity, obesity and diabetes. You have the power to control these risk factors … if you want to. I hope you will. You also know the warning signs, so you know what to do if a heart attack or cardiac arrest happens. To be even more prepared, I urge all of you to take a CPR course. 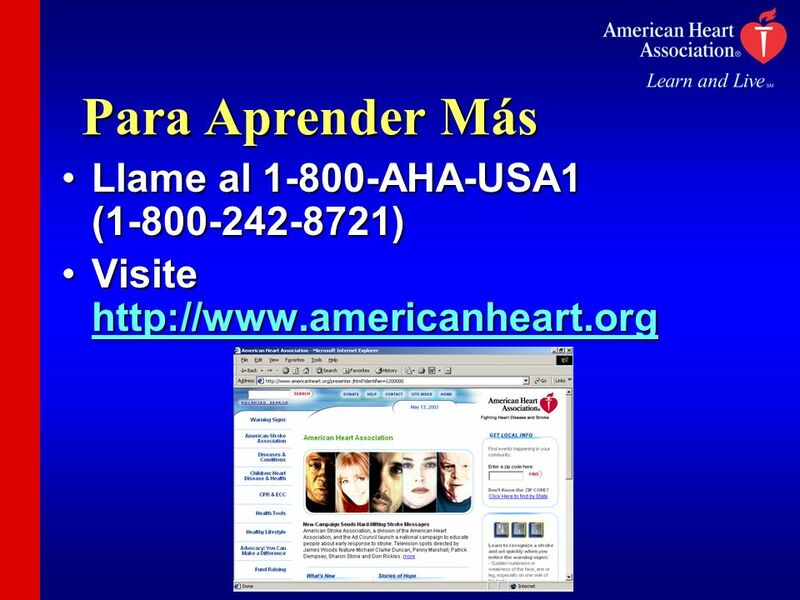 Visite If you want to learn more about heart disease, stroke, risk factors or other cardiovascular information, please call our Call Center or visit our Web site. We have lots of information to help you find out what you want to know. That’s the end of my presentation. If you have questions, I’d be glad to answer them. Thank you all for your time. 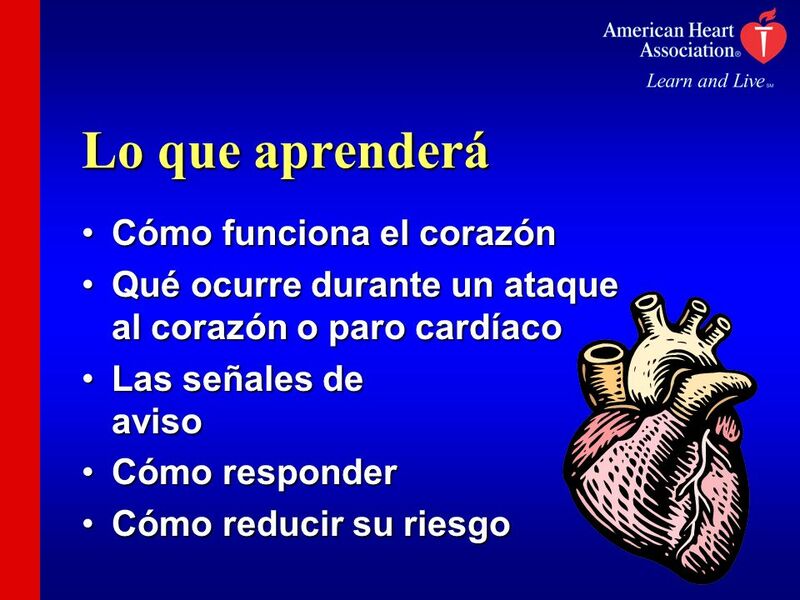 Descargar ppt "Lo que aprenderá Cómo funciona el corazón"